The best extension ladder of any size will have three traits in common: It will have D-shaped rungs for safe foot placement, swivel feet on the bottom for stability, and a non-marring top cap that prevents scratching surfaces or sliding haphazardly from side to side. For added safety, our top picks are both made of non-conductive Fiberglass, so they’re perfect for electricians, handymen, or as an all-purpose tool for use around the home. Both models also come in various lengths (from 16-40 feet). We simply list two of the more common lengths that are purchased. What length of ladder should you get? Louisville Ladder is the leading manufacturer of extension ladders, step ladders, and step stools and the FE3224 is one of their best. This 28 ft. model is rated for a maximum of 300 lbs, and meets both ANSI 14.4 and CSA Grade 1 specifications for tool and workplace safety. The insulated safety shoes are steel plated for long life, and can swivel “point-down” for extra stability in grass, dirt or other soft terrain. Louisville Ladder’s patented rung locking makes it easy to raise or lower the ladder, and it includes heavy duty slide guides to reduce wiggle and sway. While Werner ladders may be more of a household name, we prefer Louisville Ladders which are just as good but at a lower price. On the 24-ft model and above, a rope is included (unlike some other brands). The rope is both for convenience and tying off the ladder once it’ in place. If you plan to transport the ladder between multiple locations, the open-ended rungs can be annoying, since they’ll cause a continuous roaring sound as the wind blows past them while traveling. While it’s quite a bit heavier than an aluminum ladder, the Louisville will not conduct electricity the way metal ladders do. 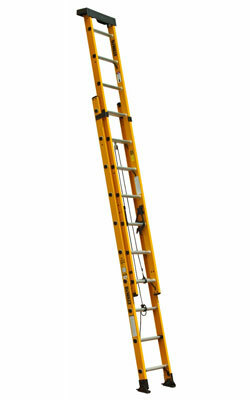 The DeWalt DXL3020 is another excellent extension ladder. It has the same 300-pound weight limit, and has some features you won’t find in any other leading model. One example of that is the uniquely designed top, which includes a hardware tray, tools slots, and a non-slip non-marring surface that gives you more support and stability when the ladder is in use. Another nice feature is that the rungs have end caps, so there will not be a loud roaring noise during transport, and you won’t have to worry about wasps or other pests getting into the rungs during storage. The rails are made of fiberglass, but are also coated with a thin layer of polyester to prevent fraying and other fiberglass damage. 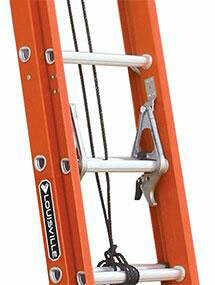 The rung locks are easy to operate, and this model comes with a rope to assist in getting the ladder up and down easily. If there is any single thing not to like about the DeWalt extension ladder, it’s the fact that all those great features add weight. 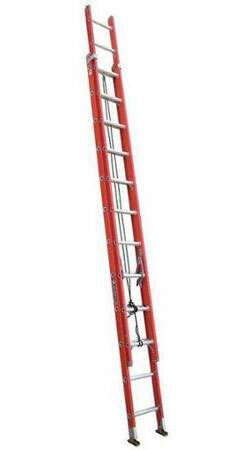 Even though it is only 16 feet long, maneuvering this ladder alone can be a job, so it may not be the best choice for the people who are not in the best of shape. Keep in mind that just because you need to reach something that’s 20 feet high, doesn’t mean you should get a 20-ft model. As a general rule, for every 4 feet up in height you need to go, you need to move the ladder out 1 foot. You also need to allow for a few feet of overhang to stay safe. So in our example, a 28-30 ft. ladder would be recommended. Firm and level base. If the ground is uneven, attach a set of ladder levelers which can be obtained from the ladder manufacturer.